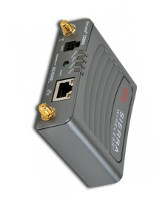 The Sierra Wireless Airlink LS300 is used on AT&T Networks for 3G and 4G HSDPG. You can improve the cellular signal to the LS300 by connecting an external antenna to it or by using a powered signal booster. The LS300 has SMA Female antenna connectors. You can connect an external antenna or Direct Connect type power booster to it (see options below).